A funny, rhyming story about a giant bear who’s sobbing because he’s lost his teddy. Tiny Eddy has lost his, too, and they come together in their joint search for their cuddly bears. There’s lots to talk and laugh about in this engaging picture book. Before reading aloud together, read it through to get the tune of this highly patterned story. This will help you to read it aloud expressively to build enjoyment and suspense.Talk about the front cover together before you start. What do children think the story will be about? As children tune in to the pattern they can join in by predicting the rhyme. Children will want to reread a story they have enjoyed. This helps them get to know the story and join in with reading the words on the page. Using the pictures, children can tell the story in their own words, perhaps wearing a bear mask, see below. Talk about the story together. What do children think it was about? Who was scared and why? How were Eddy and the bear similar but different? Make a simple bear mask using the inside of a card cereal packet. Cut out a child-sized head shape with ears for children to draw a bear’s face. They could wear their mask to tell the story from the bear’s point of view. Or you can download a template here. Use a shoebox with one side folding down to create a ‘stage set’. Children can decorate the inside as the woods by painting or sticking on cut-out trees. They can make bears from modelling material and make up their own bear stories, perhaps adding more characters and objects. Is he behind the chair? Is he in the wardrobe? Is he under the table? Is he in the basket? 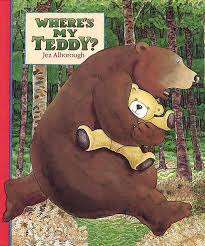 Children can make a poster of the teddy to help find it. They can draw and describe it, giving details of ways to identify the missing teddy, perhaps offer a reward and provide contact details for its return. Continue taking turns to say words that rhyme, eg Ready/Steady/Freddie until you can’t think of any more. Then read the word on the next card aloud and repeat. Rhyming pairs – download and cut out the word cards, place the word cards randomly, face up. Take turns to match words with the same spelling, eg bear/pear.